Take a break with your partner or family. Get away from the city without having to get away. 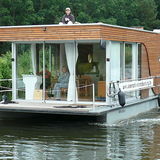 Book yourself a houseboat weekend. Sydney Harbour. You don't need a license to hire a boat – although you do need cash. Two night packages begin at $620 and go as high as $4790, depending on the time of year you book and the level of luxury you desire. And that's without including the tricky extras, like fuel, cleaning fees, bond and the like. Still, if you've got the money, you'll really appreciate the magical de-stressing powers that sedate bodies of water possess. Whether you're swimming, snorkelling, fishing, sunbaking, socialising or reading, it will feel as though your troubles are just floating away. It's a wonderful feeling to be able to escape Sydney without having to escape Sydney. It won't take you long to drive to the marina, at which point you hop aboard and motor along until you've found your own little slice of secluded heaven, before dropping anchor. Then, you simply let the water do the work. Before booking, take the time to do your research; prices vary considerably and you don't want to be lumped with any hidden charges.